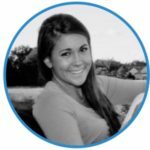 In our third and final part of our ThinkGenetic intern introductions, we are highlighting our intern from Saint Michael’s College, Courtney Burt. Each of our three interns is eager to help ThinkGenetic achieve its mission of reaching and empowering those living with and at risk for genetic conditions. Their work with us will gain them valuable knowledge and insights about the consumer healthcare space, digital technology, medical genetics concepts, and critical components that intersect in someone’s information journey. When I was 15, I cycled halfway across America (Minnesota to New Jersey) with other teens to raise funds and awareness for Duchenne muscular dystrophy (a rare progressive, genetic muscle-wasting disease that affects a close friend of mine). We logged about 1,500 miles and raised thousands of dollars, but it wasn’t easy. I’m most proud of this specific accomplishment because although I’ve accomplished “bigger things” since that trip, I always look back and appreciate what I accomplished that summer when I was only 15. Most people don’t know that I’m a decent climber. After getting certified for challenge courses by Northeast Adventure CT when I was 18, I was a climbing wall/ropes course counselor at a local summer camp for 3 years. My guilty pleasure is watching “The Office” on Netflix, 24/7. I’ve watched the entire series almost 6 times to date. Definitely guilty about that! Visiting Antarctica is at the top of my bucket list. I’ve been to four out of seven continents (North America, South America, Asia and Australia) but Antarctica intrigues me the most because the least is known about it. I first heard about ThinkGenetic through a colleague in the rare disease community, and I admire this start-up because it is unique. ThinkGenetic is not a website, but a collection of tools for anyone who needs to use them anytime during their information journey — for free. I’m looking forward to learning more about rare diseases and spreading awareness through digital marketing on all of ThinkGenetic’s social platforms. My favorite part of my internship so far has been working on the Rare Disease Awareness Campaign! Through this campaign, I learn about rare diseases and post about them so the ThinkGenetic audience can learn about them too. Being a part of the ThinkGenetic team allows me to become a part of the larger rare disease community as a whole, something that is truly valuable to me!